Heading into the bottom of the 3rd down by 2. Not the end of the world, but the Owls will definitely need wake up their offense which has been a glaring issue in this series. FAU had just 4 hits in total during yesterday's game. I'm not sure what's going on with the bats, but something's gotta change if they want a shot at saving themselves from the sweep. And just like that, the Owls are back in this! Another HUGE inning for the Owls! It looks like the bats have officially arrived in Boca Raton! Senior Richie Nizza has been really having himself a day. He hasn't gotten a lot of play time this season, but maybe we'll start seeing more of him after today? The Owls add another one to the board with no sign of slowing down! A huge inning for the Owls! Andru Summerall came in with a 2 run RBI to kick it off and FAU was able to add two more before getting shut-down on a pop out to center. A 4-run inning for #FAU further extends their lead against #LATech! The Owls now lead 11-3 heading into the top of the 9th. OWLS WIN!! After a very long weekend, the Owls pulled out a win in the final game against LA Tech to stave off the sweep. What a game! The Owls are now 12-3 in conference play, and I believe are still 1st in C-USA standings after Southern Miss' loss to FIU last night. Let's go Owls! After losing the series to #LATech, the Owls came back to save themselves from the sweep today with a huge win! #FAU will play their next game against UCF in Orlando this Tuesday. 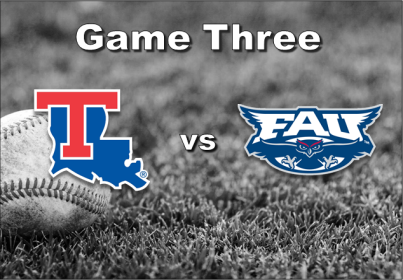 The Owls broke through on Sunday against Louisiana Tech and snapped the Bulldogs’ 10-game winning streak in the process, in an 11-3 victory at FAU Baseball Stadium. Ironically, FAU lost the series even though they oustcored the visitors 15-10 overall. The win keeps FAU (24-11, 12-3 C-USA) a game ahead in league standings, as Southern Miss defeated FIU on Sunday, 15-7, to go to 11-4 in league play. FAU has also won 21 of their last 26 games. "I thought it was a good win, the guys battled through some adversity the last two days", said Head Coach John McCormack. "Some of those freshmen are coming alive, 24 of the 27 outs were from freshman pitchers, that was encouraging to see." For the third straight game, the Bulldogs took the early lead, scoring once in the first and again in the third. A run-scoring single in the home third by Eric Rivera cut the deficit to 2-1, and the Owls went ahead for good in the next inning, on an RBI groundout by Richie Nizza, and with two outs, Jacob Josey deposited a single to right-center for the team’s first lead of the series. FAU would add three in the fifth (two coming on a Joe Montes double), another run in the sixth, and though LA Tech scraped one across in the eighth, put it away with a four-spot in the bottom half of that inning for the final margin. Three freshmen – Jon Jon Kostantis, Hunter Cooley and Michael Schuler – gave up just three runs in eight innings, and another newcomer, Ryan Sandberg, dealt a perfect ninth to wrap the win. All nine Owl starters reached base in the win, while Eric Rivera and Montes each had three hits. Rivera scored a run and had an RBI; Montes scored once with three runs knocked in. Kostantis (3-0) went a career-high four innings, striking out three and allowing two runs on three hits while picking up the victory. The Owls will go on the road for the next five, starting Tuesday night in Orlando at UCF for a 6:00 PM scheduled first pitch. LA Tech checks into the baseball news poll at #21…so that's that. We lost to a very good team. Interesting that FAU fell from 21st to 27th - I know LaTech just took two from the Owls, but the records/resumes are fairly close for there to be 6 spots difference. Other notes form the poll - 8 teams from the SEC and 6 teams from the ACC (more than 1/2 the top-25 are from those two conferences). Seven from the ACC if you extand out to the top-26 with FSU. FAU is right behind UF and FSU. Four team in the top-27 are from the state of Florida, but none higher than #22 (Miami). The state of California also has 4 teams in the top 22, and they have the #1 and #2 teams in the poll. Baseball certainly seems to for the most part mimic the other sports in that the P5 gets all of the recognition in terms of polls, but of course anybody can earn their way not only into the tournament but also to the National Championship (see Coastal Carolina from a few years ago and other teams like UC Santa Barbara sitting at #7 in this current poll). If FAU can work their way into a regional, they don't appear to be grossly over-matched with the other likely Florida-based teams who will be in. Is there a chance for CUSA to have multiple teams make it? Seems like LaTech, FAU, and maybe even USM are worthy, but I am clueless if even two would be realistic. Absolutely yes. And the three you mentioned, imho, will probably make the tourney. Baring any slide by one of them. The difference this year is our usual regional locations, Gainesville, miami, seem winnable. Those guys have shown some weeknesses this year. But fau needs to keep winning. The magic number of 40 wins is key. It is possible.